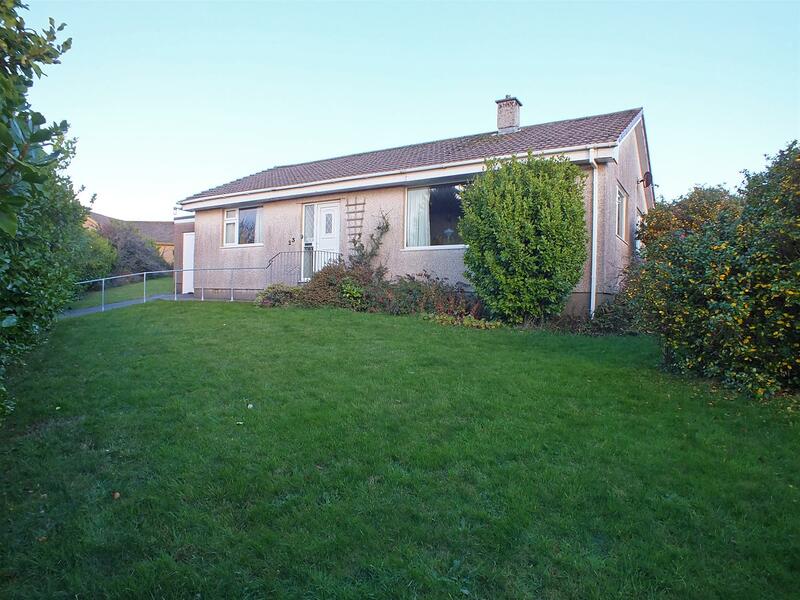 A Spacious, Detached True Bungalow in a Popular, Established Cul De Sac. Occupying a Generous Plot with Excellent Scope for Extension STPP. Easy Access to Onchan Village Amenities & The Financial Sector. In Good Order Throughout But May Benefit from Further Modernisation. Comprising Entrance Hall with Cloaks, Airing & General Storage Cupboards. Light & Airy Dual Aspect Lounge/ Diner & Spacious Breakfast Kitchen. 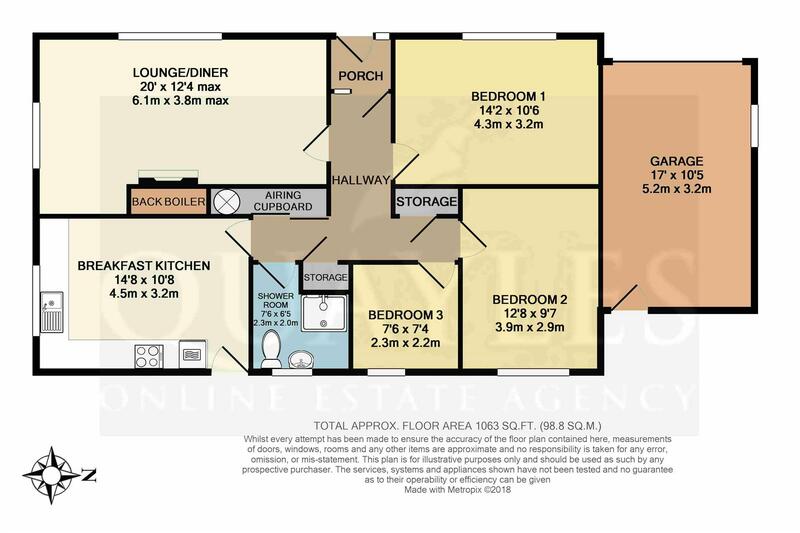 3 Bedrooms (2 Generous Doubles) & Shower Room. Gas Fire Incorporating a 'Baxi' Boiler Providing Central Heating & Hot Water. Double Glazed in uPVC Throughout the Living Accommodation. Attached Single Garage & Off Road Parking for 1 Car - Scope for More STPP. Generous Enclosed Lawned Gardens to the Front, Side & Rear. Large Summer House & Private Patio Adjacent to the Kitchen. From Douglas, travel along Governors Road, straight across the mini roundabout by the petrol station/ pharmacy and on to Whitebridge Road. Continue along to the traffic lights then take a left turn onto the A38/39 Avondale Road, passing the Village Walk shopping centre on the right. Continue up taking a right turn into Highfield Crescent then first left into Sunnybank Avenue. Turn right and continue almost to the end of the cul de sac where the property will be found on the right hand side. Steps up to the half glazed uPVC entrance door with a matching side panel. Coved ceiling. Obscure glazed wooden door and side panel to the entrance hall. Coved ceiling. Cloaks and storage cupboard, both with hanging rails. Airing cupboard housing the hot water cylinder. Loft access. Smoke detector and power point. A spacious, dual aspect room with uPVC windows to the front and side which enjoys garden views with hills in the distance. Space for a table and chairs if required. Gas fire with a decorative surround and fitted 'Baxi' boiler which provides hot water and central heating. Coved ceiling. Wall and ceiling lights. Television point. Fitted wall and base units together with work surfaces incorporating an 'Electrolux' ceramic hob. Adjacent built in 'Tricity' double oven with grill. Single drainer, stainless steel sink unit. Space for a washer, dryer and fridge freezer. A uPVC window looks out over the rear garden. Space for a small table and chairs. A half glazed uPVC door leads out to the garden. Fully tiled and fitted with an 'Olive Green' WC and pedestal basin together with a corner enclosure housing a fully plumbed shower and grab rail. Having a uPVC window to the rear elevation. NB the maximum measurement incorporates the cloaks cupboard in the hall. A single room with a uPVC window to the rear. Built in shelving and telephone point. A double room with a uPVC window looking out over the rear garden. Ample space for free standing wardrobes and drawers. A generous double room which could easily accommodate a 6ft or twin beds. Space for wardrobes and drawers. A uPVC window looks over the front garden. Television and telephone points. The property is set on a particularly generous plot with excellent scope for an extension subject to planning permission. Mature hedging offers much privacy and shelter. A concrete drive provides off road parking for one car and leads directly to the attached single garage. Fitted with a 'Hormann' up and over entrance door which could be wired up to be electronically operated if required. A timber framed window provides natural light whilst a half obscure glazed uPVC door leads out to the rear garden. Electricity meter. Light and power points. The gardens are primarily laid to lawn and extend from the front to the side and rear. There is a patio adjacent to the kitchen and a large summer house which enjoys the last of the evening sunshine. Mature flowering shrubs and hedges. Cold water point. All mains services are installed. Gas fired central heating via a 'Baxi' boiler fitted behind the gas fire in the lounge. Double glazed in uPVC throughout the bungalow.